You can now leave the pin in, when putting on the green. The new rules brought in this January, are an excellent step in the right direction to making the game quicker and more appealing. My favourite new rule is allowing the flag to be left in when putting on the green. Here is why. It will aid speed of play, without a doubt. Rather than having to wait for your playing partner to get over to the pin, while you are ready to pull the trigger on your birdie putt, you can go right ahead and get it done. Faster is definitely better for everyone. From a playing point of view, that flag stick in the hole can act as a back stop for you, particularly on a sloping, downhill, tricky left to right putt. Leaving the flag in will make the hole seem larger. Trust me, it will. It will also reduce the fear of running your putt way past, as any contact with the flag stick will slow the ball a treat. 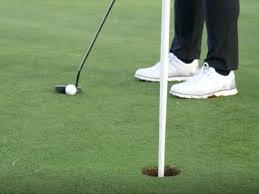 Granted, there may be the rare occasion where the ball may ricochet off the flag stick and stay out of the hole, when without it being there, the ball may have dropped in. But I would estimate this to happen only a 20th of the times that the ball will be helped by leaving the flag in. So in summary, this new rule will help on both fronts – speed and performance. I recommend that you leave the flag in when putting, let it give you more confidence and watch those putts drop. For more info on this and some of the other rule changes, take a peek at this summary from Golf Monthly magazine.